The porch thermometer read -10 F (-23 C) and there was bright sun in the backyard, but there were no birds and no squirrels present at or under the feeders. Finally about 10 a.m., the first foragers appeared. 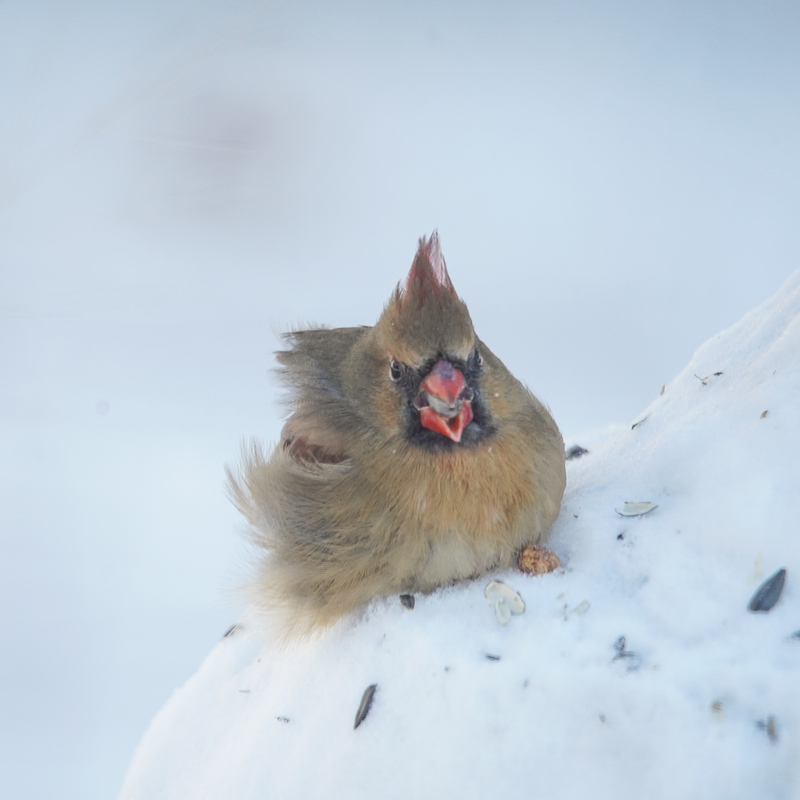 The thermometer had worked its way up to just under 0 degrees F (-18 C), but the wind was blowing, so windchill temps would be well below 0 F.
Mr. Cardinal monitored the surroundings while Mrs. Cardinal foraged at the bird feeder. She is finding the discarded sunflower seeds left by the chickadees and nuthatches who pitch them out of the feeder in search of peanuts instead. 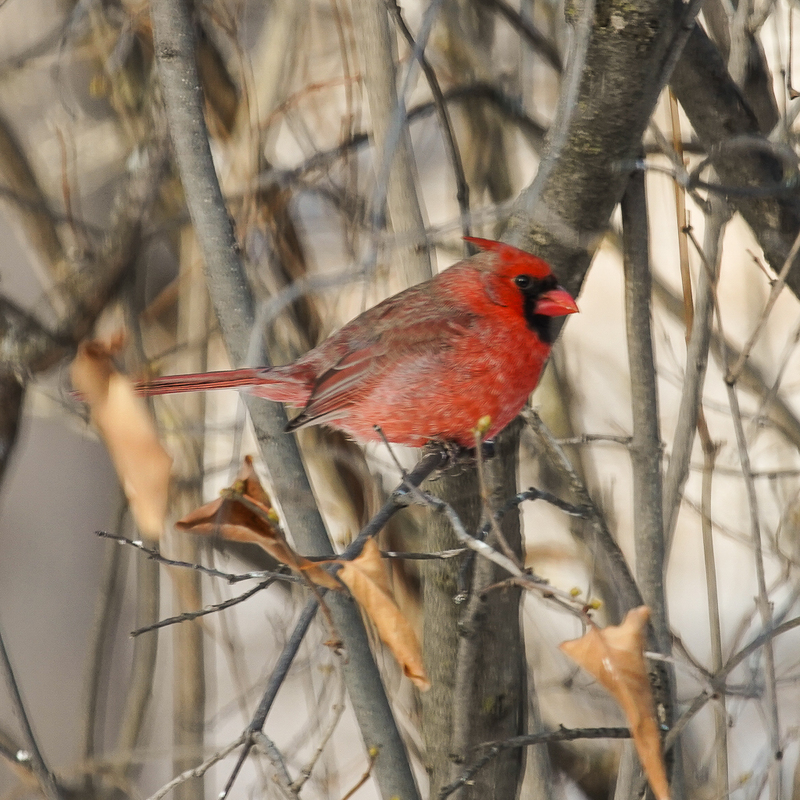 The wind is fluffing out her feathers, but also carrying away her body heat. 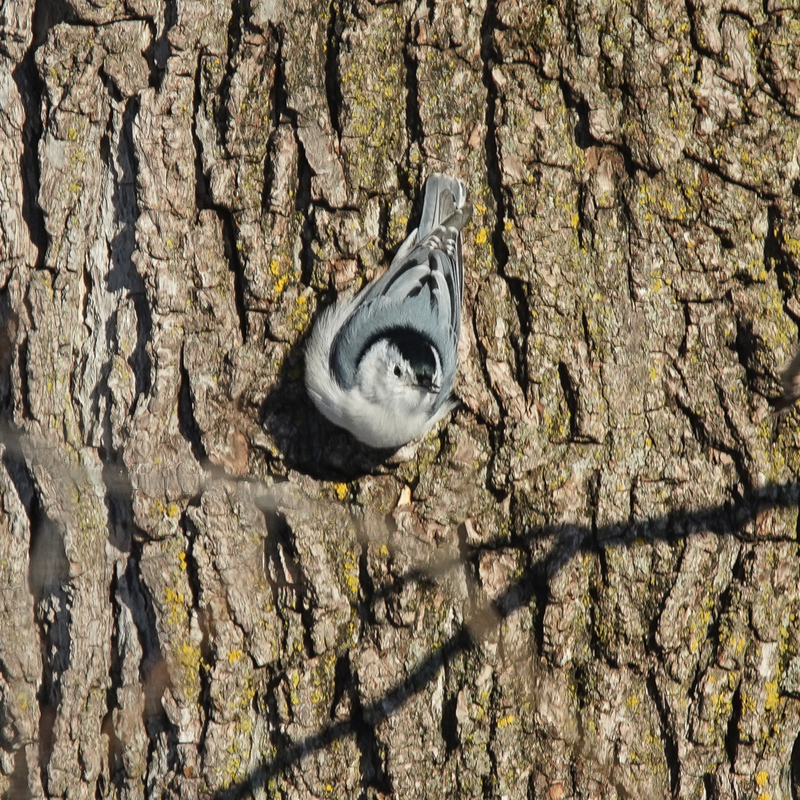 This White-breasted Nuthatch is stashing a peanut in a bark crevice, where it will hammer at it until it breaks off pieces it can eat. I wonder if the crevices are more apparent when they are upside down, or it’s easier to break them up when they come at it upside down???? 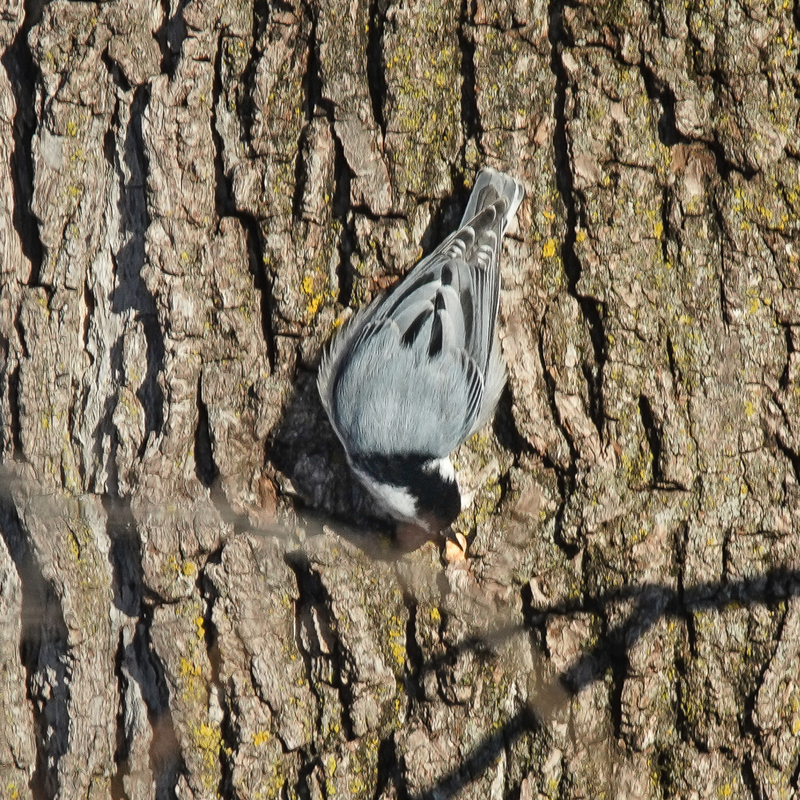 After much hammering away, the Nuthatch has reduced the peanut (directly under its beak) to just a small chunk. 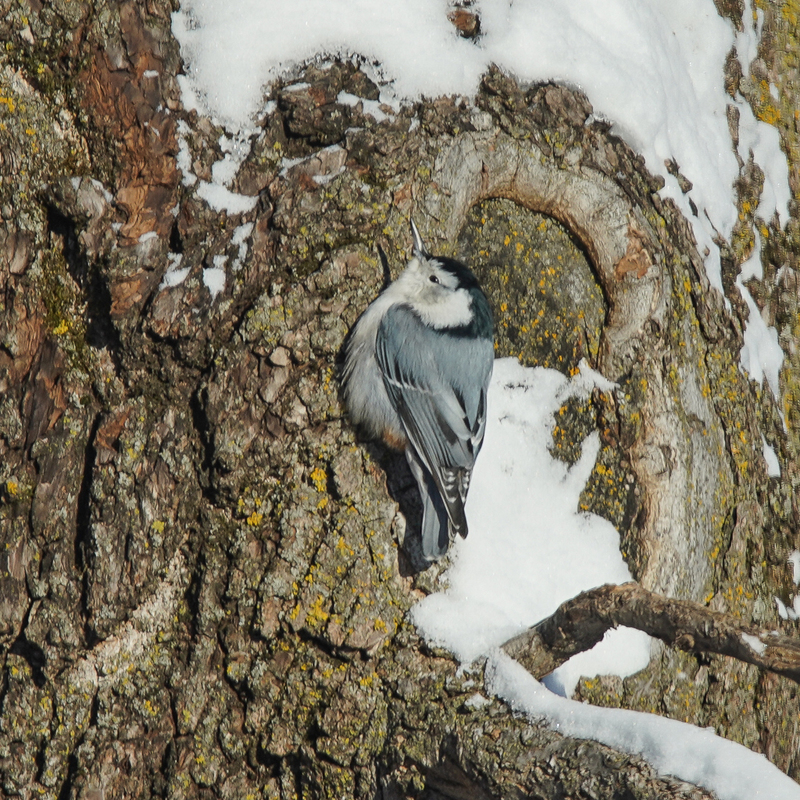 You know it’s cold when you see a Nuthatch pause for several minutes in its foraging efforts to bask in the sunlight. The bird’s back was directly facing the morning sun. Peanuts are the preferred high-energy foods on subzero days. 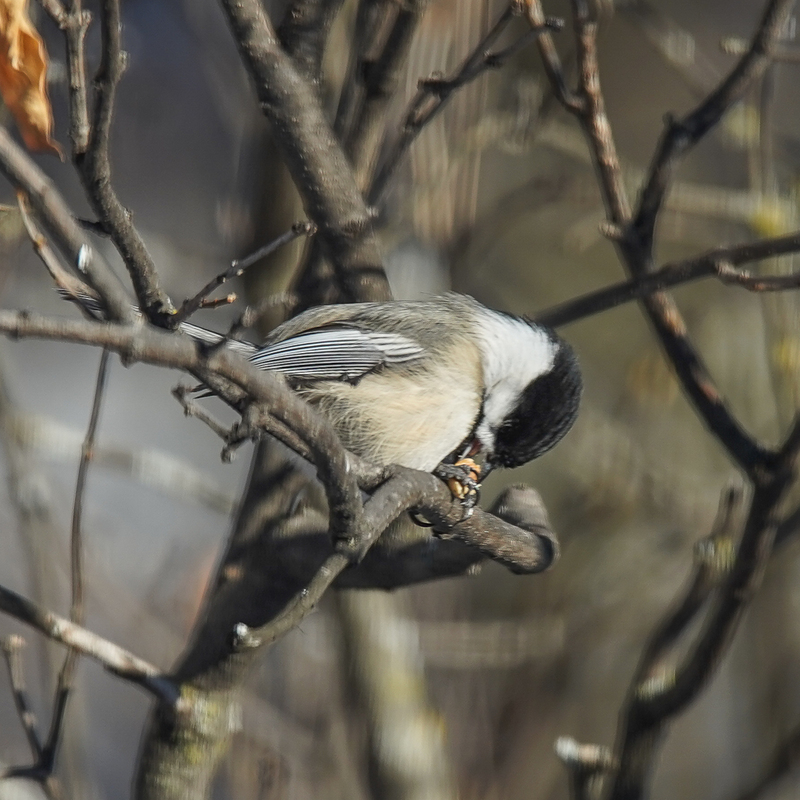 The Chickadee’s method of eating the peanut is much different — grasping the nut with its foot, the bird drilled into it to break off small chunks. But peanuts at -10F must be brick hard, because this bird drilled it over and over and was only able to break off small bits. After much effort it finally flew off with the nut, perhaps to its roost hole. The Goldfinch watched the Chickadee eating a peanut but made no attempt to go find some food for itself at the feeder. 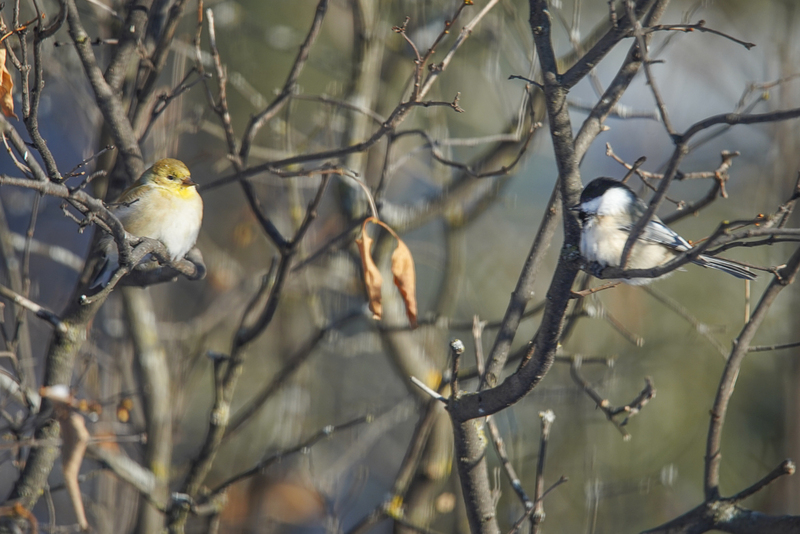 Two birds exhibiting contrasting strategies for surviving harsh winters in the northern temperate climates: Goldfinches turn up their metabolic furnace to keep their body temperatures stable on extremely cold winter nights; they do this by harvesting fat-rich seeds (like sunflower seeds) and keeping their fat reserves high. 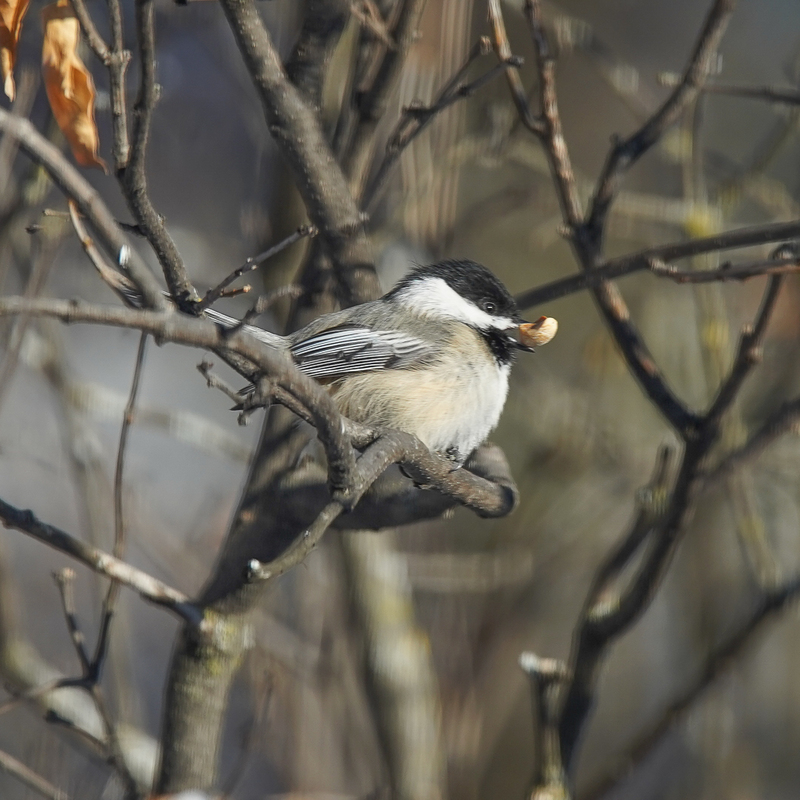 Chickadees are primarily insectivores that do eat seeds in the winter, but typically conserve their internal fuel resources by lowering their body temperatures at night — just in case they need it to find food the next day. 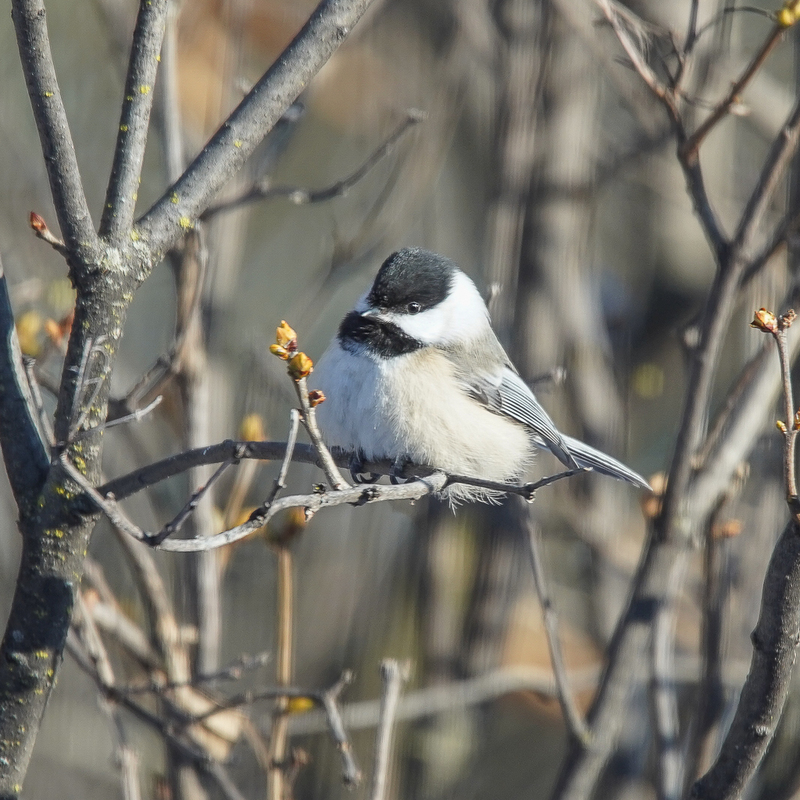 The heartiest of little winter birds…Chickadees are survivors! By noon, the wind had picked up, and the temperature had dropped again, on its way down to an overnight low of -27 F (-32 C), and I didn’t see birds at the feeder for the rest of the afternoon. I hope they survived overnight! Herons and egrets were everywhere at Lake Temescal Park in Oakland, CA. On my early morning walk around the lake, I counted 10 juvenile or adult Black-crowned Night Herons. 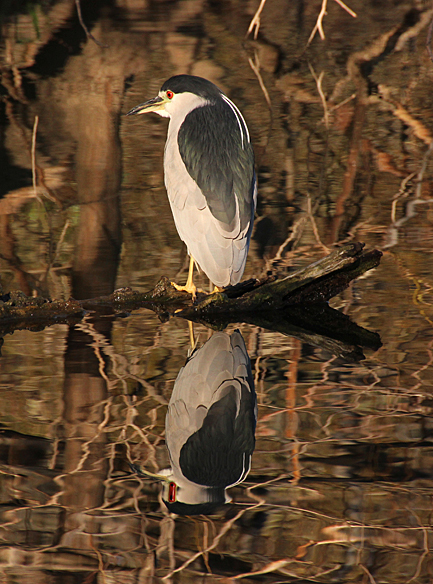 An adult Black-crowned Night Heron posed over still water. Two decorative white plumes trail down its dark back. 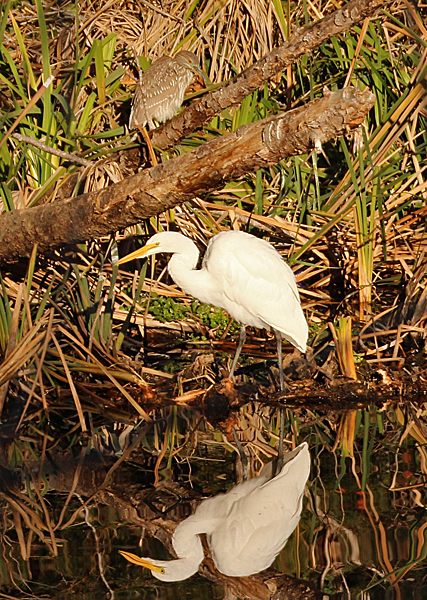 A juvenile Black-crowned Night Heron walked into the photo I was taking of the Great Egret and its reflection. The heron must have been perched nearby but starting moving toward the egret as its larger cousin moved closer to the shore. Maybe the little heron was hoping for a stolen bit of fish or frog. 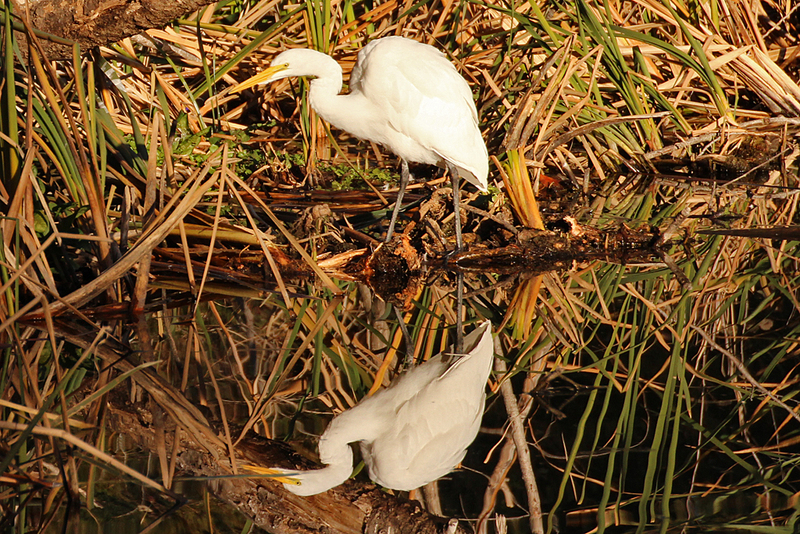 It’s difficult to photograph white birds in bright sun; I think the reflection actually gives better contrast. I wondered why there were so many herons and egrets on this smallish lake until I saw the success the fishermen were having this morning. Both of these species are “sit and wait” predators, but the smaller heron is by far the more patient of the two. It sits completely still, never moving anything but its head occasionally, while the egret stares at the water for just a few minutes in one area before moving to a new one.